The world of beauty is so much knowledgable today than it ever was. We have information at our fingertips, we only have to look online to research the best serum we should be using for our specific skin type and concerns. This is amazing because having all this information readily available, there is no-one to blame but ourselves when we look in the mirror in 10 years time and see the damage that has been caused by not using the right products or adhering to the correct advice. But this isn't going to happen, girls and boys, is it? Because we can act now, no need to repent later. I bet our parents would love to have had the information that we have today. With all the scientific innovation and testing that skincare companies undertake, we know the dos and donts and what products suit our individual needs. The two most important things that I have learned over the past ten years (before that I didn't take much notice) is that wearing an SPF everyday when I go outside will prevent my skin from sun damage and therefore premature ageing. The other thing is to use a retinol provide which reverses the signs of ageing. These two things are the only skincare advice that can legally call themselves 'anti-ageing', anything else is just advertising. However, science is going one step further and introducing the concept, and products, of preventing ageing before it actually happens. So, listen up all you young ones! This is the information and products that we would liked to have known about! There is no denying that we will age, we can't and shouldn't want to stop this process. The word anti-ageing gets used far too frequently. We don't want to stop ageing, we just want to slow it down as much as humanly and safely possible. So there is not better time to start doing this, new research is suggesting, than before the signs of ageing have even kicked in. 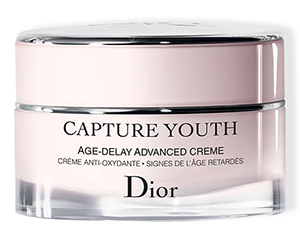 I'm sure this technology will soon filter through the entire beauty world but in the meantime, and ahead of the game, is Dior, who launched a new skincare range Dior Capture Youth. And to capture the young audience, Cara Delevingne is the face of this range. Wouldn't we all like to stay as young looking as Cara?! Dior's Capture Youth includes an antioxidant base cream along with 5 targeted serums, which you choose to suit your personalised needs. The ingredients in these products, whilst targeting existing concerns, also tackles the sign of ageing before they have occurred. The Dior Capture Youth Creme is infused with natural origin Iris Florentina extract which works alongside the skin's fundamental natural antioxidant defence system* to help strengthen the skin and help fight against the appearance of signs of ageing even before they appear. Specially formulated to be gentle on skin, this cream is composed of 88% naturally derived ingredients. The skin appears toned, smoothed and reinvigorated and is youthful-looking for longer. Combined with the targeted Capture Youth serums, this cream reveals perfect skin quality. Choose one or two of the serums to suit your specific requirements; if you need a healthy glow, then choose the Glow Booster and when your skin needs an extra lift, choose the Lift Sculptor. For an injection of hyaluronic acid and a moisture boost, opt for the Plump Filler and the Redness Soother is perfect for those with sensitive skin. Lastly, if you need to control shine, then choose the Matte Maximizer. Each one targets areas of concerns and if you have more than one area of concern, then you can layer the serums. To use the Dior Capture Youth system, choose 1 or 2 of the serums and apply them to your skin before layering with the Age-Delay Advanced Creme or mix a couple of drops of the serum to the creme.